These were my grandfather's cabinets, handed down to me and I just don't have the room or office anymore. 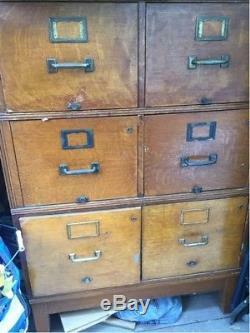 Antique stackable file cabinet with 6 drawers. These are side-by-side drawer units, so there are 3 stackable wooden frames, each holds 2 drawers. There is a top and floor stand that finishes the unit. These are very old, and they still roll in and out smoothly, but the rubber (bumpers / stops) is brittle. Note that the drawers have slightly different detailing, but everything fits together clean and tight. Interior dimensions of each individual drawer (that is each drawer in set of 2 drawers side by side), as pictured (though you can reconfigure this via the stackable modules). Top pair of drawers: 12" W x 9 3/8" H x 23 D (Std size). Middle pair drawers: 12" W x 10 1/4" H x 23 D (Std size). Bottom pair drawers: 15" W x 10 3/4" H x 23 D (Legal size). To be clear the sizes listed are interior dimensions of each drawer. Please ask questions, I'll be happy to respond. The item "Antique Oak File Cabinet 2 drawer side-by-side stackable standard files" is in sale since Tuesday, November 14, 2017. This item is in the category "Antiques\Furniture\Cabinets & Cupboards\1900-1950". The seller is "lurvin" and is located in Chatsworth, California. This item can't be shipped, the buyer must pick up the item.